Music, as you'll have noted has played a very large part in this website, so, upon our return to Exeter, as well as our visit with David Oddy, we could think of no better place to experience music of a slightly different sort, than Exeter Cathedral, while at the same time admiring the incredible grandeur of the said cathedral. We'll provide the links to the various aspects of the musical life of the cathedral including a look at the organ. Having said that, what follows is, first, some general information about Exeter Cathedral, and then a brief historical overview. Exeter Cathedral is one of England's most beautiful Medieval cathedrals and represents one of the finest examples of Decorated Gothic architecture in the country. For centuries Exeter has been dominated by the Cathedral with its two massive Norman towers and its West Front decorated with sculptures of kings, saints and angels. Inside the Cathedral are treasures in abundance: an astronomical clock more than five hundred years old, the Great Organ still in its original position since 1665, the Minstrels' Gallery with carvings of angels playing fourteenth century instruments and a Vault which stretches unbroken for one hundred metres. There is a huge medieval window with nineteen full-length figures including Sidwel, the local saint, and a fifteenth century wall painting. 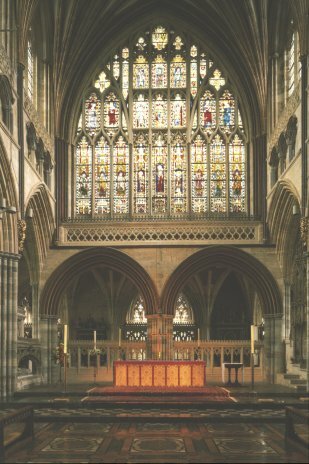 Around the north and south wall of the Nave are cushions, on the original stone plinths, which depict the history of the Cathedral, city and county from Roman times to the present day. Together with the natural colours of the stone the whole building creates a space for peace and meditation, while offering much for the visitor to see. There are regular daily services, which visitors are welcome to attend, as well as concerts, organ recitals and other cultural events. Guided tours are available at 11.00am and 2.30pm Monday to Saturday (11.00am only on Saturday), and during July and August there is an additional tour at 12.30pm (except Wednesdays). All these tours are subject to Cathedral commitments. Group bookings and special visits may be arranged through the Visitors' Officer on +44 (0) 1392 214 219. The Cathedral Shop is open Monday to Saturday 9.00 am to 5.00 pm, except when services are taking place. The shop stocks a wide variety of books, compact discs, cassettes, postcards and gifts. The Refectory is situated in the Cloisters. It is open from Monday to Saturday from 9.45am to 4.45 pm serving coffee, tea, lunches, home-made cakes, scones, etc.